The food and beverage industry in Los Angeles saw its share of culinary trends in 2010, from pop-up restaurants, a return to good butchery, local sourcing of food (locavorism), Asian comfort food, a celebration of bacon, mezcal cocktails, house-made charcuterie, head-to-head competition on TV shows, good old fried chicken, snout to tail dining, wholesome pies in lieu of cupcakes, celebrity chefs opening up shop in tinseltown, and food and restaurant wars. It was a busy but fruitful year for me, navigating through these food trends and traveling around the world in search of delicious nibbles. Through it all, there were 12 dishes that left a strong impression on both my palate and my heart. I had many delicious dishes this year, but these 12 dishes that I selected had something else that made it truly special. Food is an expression of a chef’s love and an extension of a chef’s soul. When a chef cooks from the heart with genuine care and intention, that essence comes through in his or her food, and speaks directly to the diner. Through personal interactions with these special chefs, I was able to taste, smell and see the beauty of their creations with a higher level of respect and understanding. Behind each dish was a talented chef with a radiant smile that I will never forget. Despite its 2 Michelin star status, there is no pretentiousness or attitude at this humble 39-year old restaurant in Tokyo. 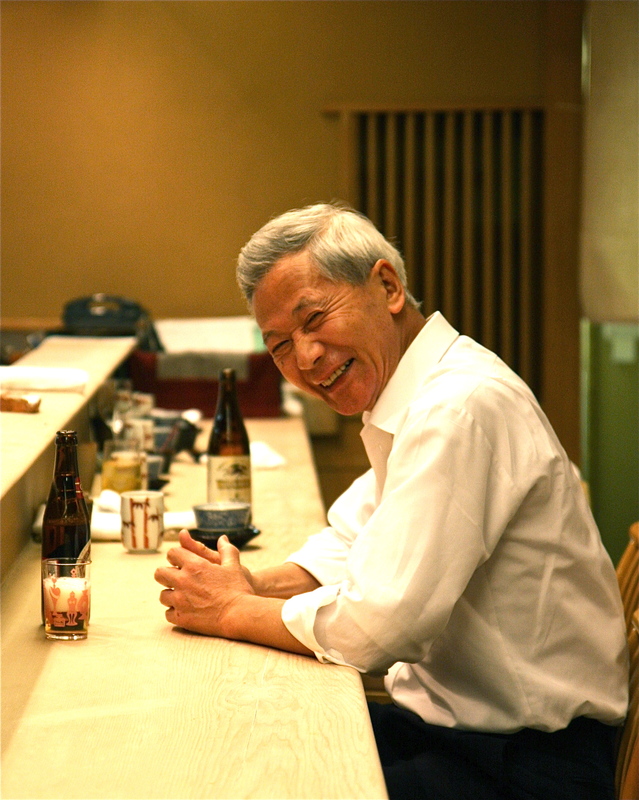 I have been coming here every year for the last 6 years, of course looking forward to the meticulously prepared food, but more eager to see Chef Kenzo Sato’s lovely smile. His warm hearty laugh and funny stories are the finishing spices to each delicate dish that is prepared in front of me in the open kitchen. There is a special comfort and security in coming here, for he knows my likes and dislikes, and prepares a sensational omakase meal according to my palate. 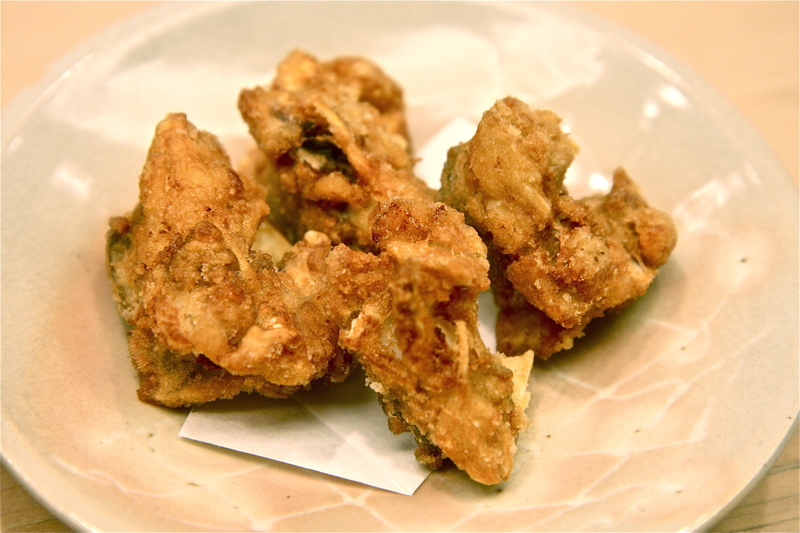 I never have to order or remind him of what I want- it is already understood, and the highlight of each experience comes in my favorite dish at Shigeyoshi, the deep fried puffer fish dish, which he saves for me. It goes without saying that it requires a special license and tremendous skill in preparing the poisonous puffer fish, but it takes special love and thought to prepare this simple but comforting dish of fugu. The best pieces are from the head, with thick wedges of white tender meat juxtaposed against gelatinous jiggles of fat fugu lips. Chef Sato smiles as he watches me attack this dish, waiting to resume conversation until I am done licking my fingers clean. To this day, that life-changing satisfying bite into the crunchy tostada generously topped with sea urchin, heaps of freshly shucked pismo clams, avocado and home-made ‘Chilito Exotico’ salsa, haunts me. My body craves it, my mind obsesses about it, my dreams are dominated by it. 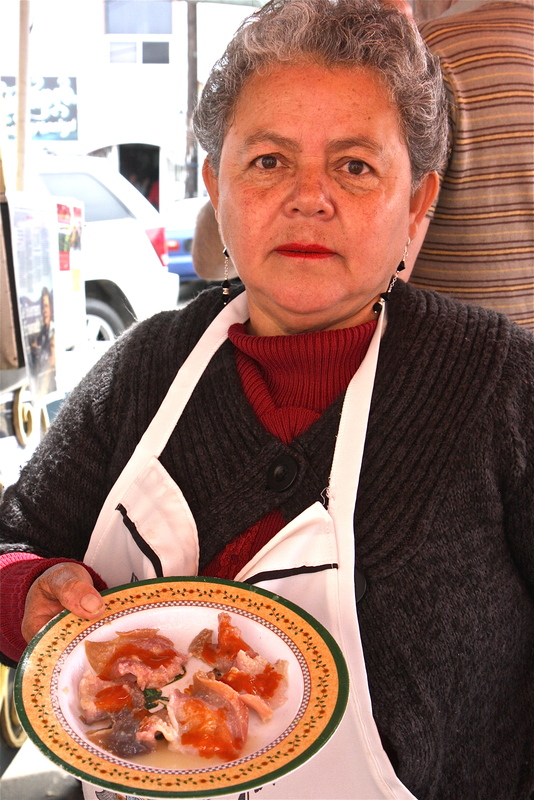 Matriarch Sabina Gonzalez, who has been operating out of a small food cart on the street corner of Ensenada in Baja Mexico for more than 30 years, creates each tostada to order, smothering it with fresh offerings from the local Baja waters and topping it with motherly love. It’s a family affair, and her daughter comes down from San Diego on the weekends to shuck clams and oysters as the master cocktailer. Each bite releases a splash of ocean breeze inside my mouth before the distinct savory spices of the pineapple salsa kicks in. 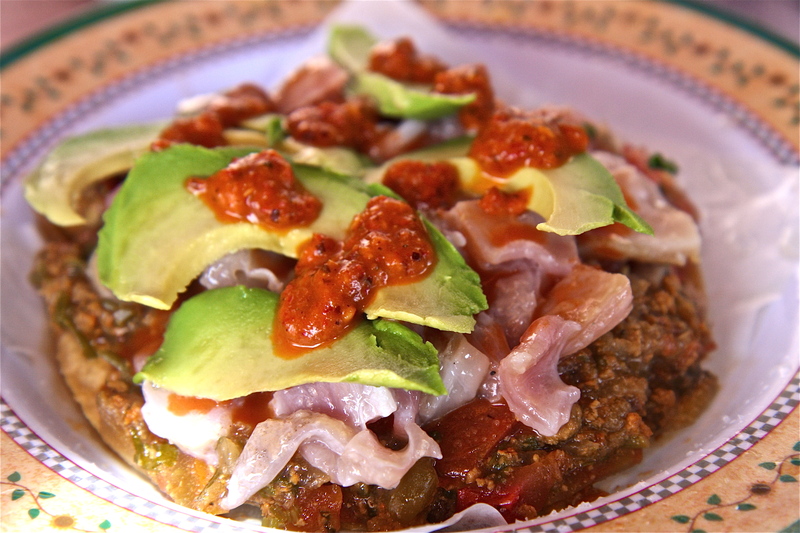 This is pure Baja, and it doesn’t get any better than this tostada, followed by a big hug, both from Sabina. It wasn’t just the fun geometric shapes or the vibrant color palettes in this octopus carpaccio that won my heart, but the innovative concept of compressing octopus legs into round sausages and slicing them thin to reveal wheel-like cross sections that impressed me in the cebiche themed restaurant of accomplished Tijuana chef Javier Plascencia. The gelatin coating around the octopus legs acted as a natural food glue to keep the circles together. 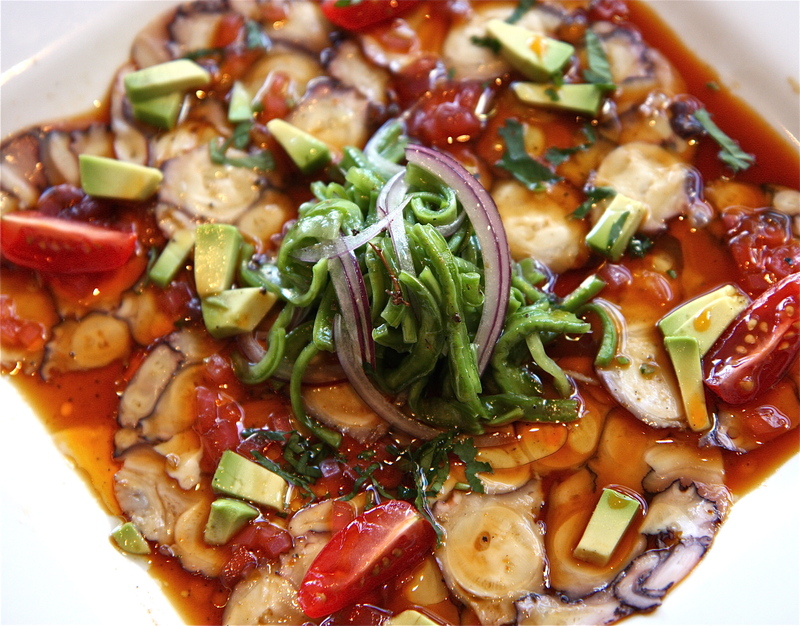 The tender octopus slices in ponzu sauce were given a unique Baja twist with the contrast of buttery avocados and crunchy, slimy nopales. A refined and beautiful dish with unforgettable textures and delicious flavors is sure to be an industry secret, I thought, but I was struck by Chef Javier Plascencia’s openness about sharing his secrets. ‘Shoot me an email and I’ll send you my recipe’, he told me, ‘and let me know when you come down to Tijuana, I’ll make sure to be there for you’. Really? 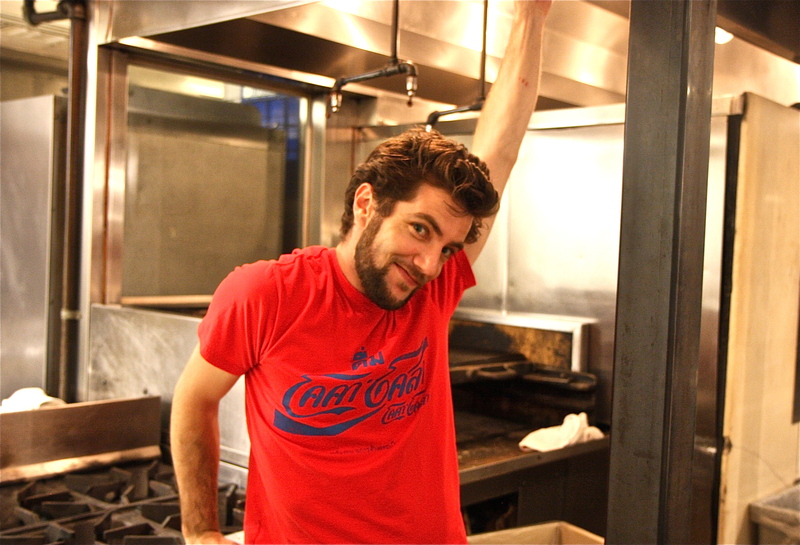 The amazing thing about this incredibly handsome and kind chef is that he actually means every word that he says. And with 7 amazing restaurants under his belt and a highly successful run at Test Kitchen where his fig leaf wrapped short rib dish was deemed one of the best dishes of the year by Jonathan Gold, he still maintains the same level of approachability and humility. As a fourth generation German Konditormeister, or Master Pastry Chef, Thomas Haas was genetically destined to become a sensation in the pastry world, and his talent is evident in every tasty morsel of chocolate ganache and chewy caramel. At his namesake patisserie in Vancouver, he creates a peaceful haven of sweets where one can enjoy a warm cup of herbal tea with sandwiches, tarts, cakes and chocolates while shopping for hot chocolates and cookies. I went in for his famous chocolates, but was swept off my feet by the perfection of his macarons, especially the passion fruit macaron. A perfect crunchy outer shell that gives way to a soft moist merengue, leading right into the flavorful center filling- the textures and flavors were spot on in these delicate little bundles of joy. 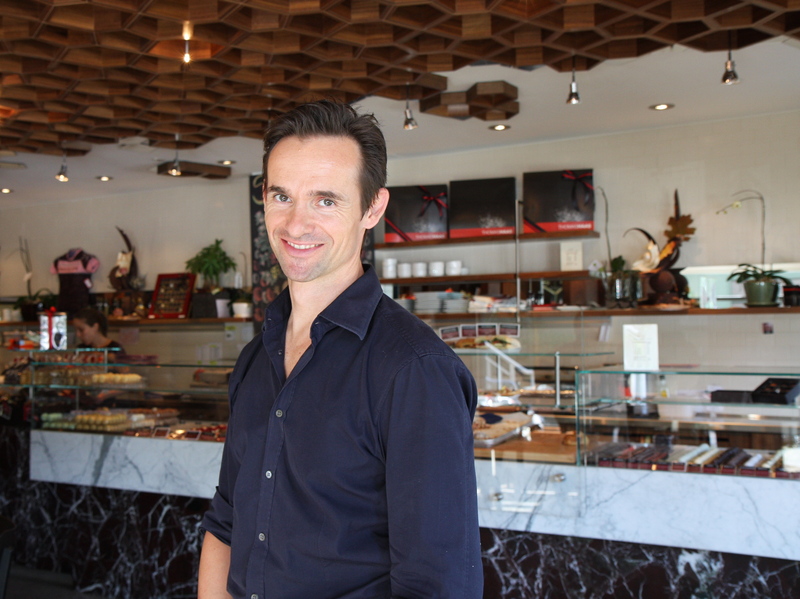 Despite being a world-renowned patissier and busy restaurateur, Thomas Haas was behind the counter, packaging chocolates to order, working the cash register, giving advice to customers and even cleaning tables. 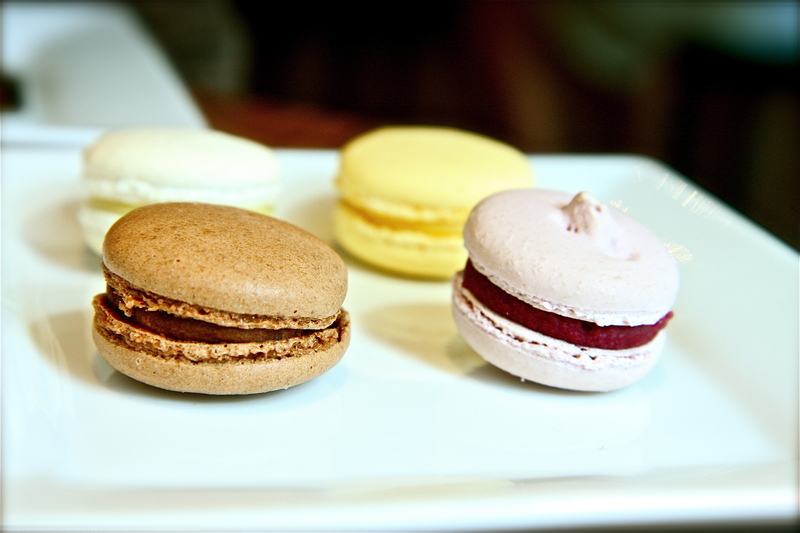 I had met him the night before at a restaurant in Vancouver, and he welcomed me with a bright smile to his patisserie, bringing over these wonderful macarons with a pot of tea to my table. With such a hands-on approach to running his patisserie, I knew that he personally made these macarons by hand, which made them taste even better. How do you honor an aromatic, majestic piece of black truffle? Leave it to talented Chef Haru Kishi, formerly at the Gordon Ramsay restaurant in West Hollywood, and now executive chef of Chaya Brasserie. 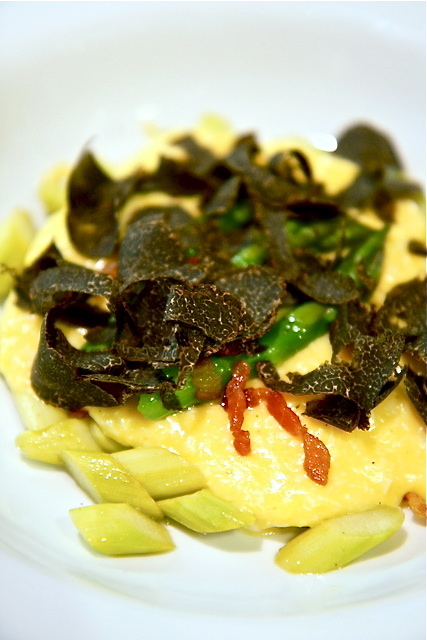 Perfectly cooked scrambled eggs, patiently prepared at low temperatures, made fluffier with soft boiled egg whites passed through a fine sieve, spooned over a bed of asparagus and bacon, and garnished with dramatic shavings of black truffle that release its pungent aromas with each passing across the sharp blade of a truffle slicer. The delicate crunch of asparagus, the smokiness of bacon, the soft pillowy texture of warm fluffy eggs, the final strong hit of truffle essence that spreads inside my mouth and permeates up into my nares- a decadent, rich and unforgettable experience worthy of a final meal. Life is perfect at that moment, and nothing else matters. Everything that this talented chef makes is amazing, and I have personally seen the tremendous amount of thought that he puts into his work. As a close friend, it makes me happy to see him blossom through his various struggles and finally come into his element at Chaya Brasserie, a most fitting location for his Japanese and French background. Marcel Vigneron has become a household name since he became famous on Top Chef season 2, and currently on Top Chef All-Stars. Although he has gained a reputation as the Top Chef villain, in real life he is quite the opposite. Personable, thoughtful, kind and extremely fun to hang out with, he is one of the most hard working chefs in Los Angeles. He’s obviously talented and gifted with charisma, but behind the scenes he puts in just as much thought and hours into each beautiful and innovative creation. One such plate that I still think back to is the venison tenderloin tartare with macadamia nuts, capers, pickled cipollini onions, beet root brunoise and walnut oil. 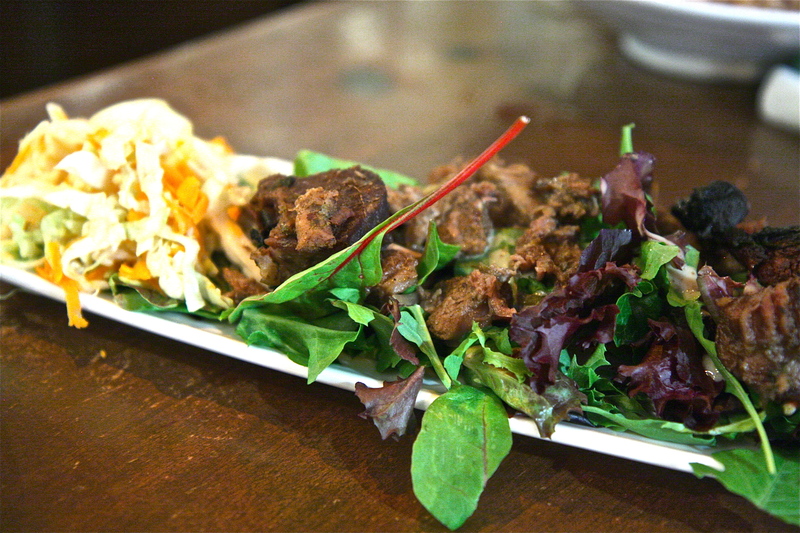 The venison was prepared perfectly with a fine balance of acidity and flavor. 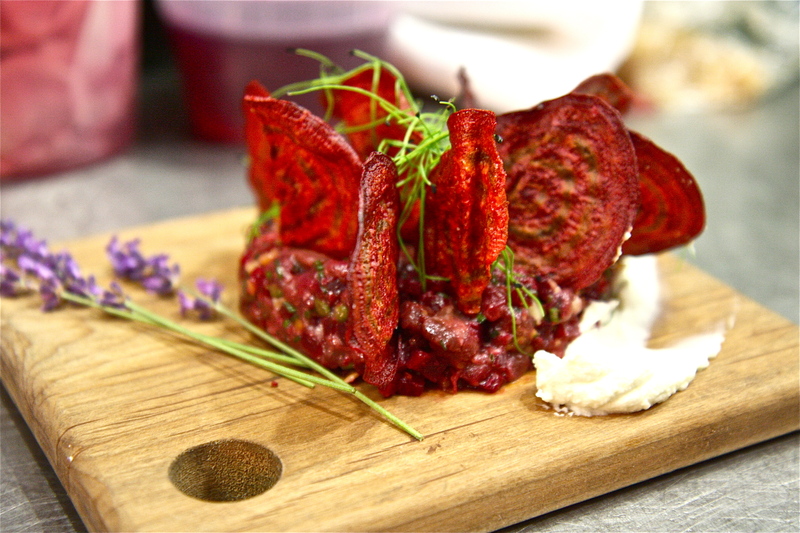 Scooped onto a crispy red beet chip with a smear of wasabi cream and a hint of lavender aroma wafting from the board, this delectable dish transported me to venison heaven at a private dinner party at Terroni restaurant. Spending the entire day with the chef, from shopping at the farmers market to prepping in his kitchen, I was able to see an inspiration evolve into an idea, an idea into a sketch, and a sketch finally culminate in the most breathtaking dish. Buckwheat flour and water- there are only 2 simple ingredients in making Kikouchi soba, making it that much more of a complex dish. 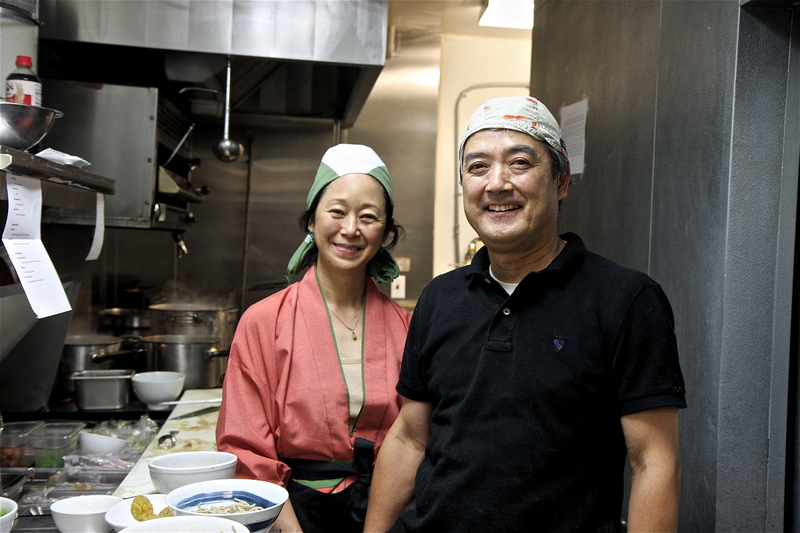 Soba master Akila Inouye and soba artisan Sonoko Sakai have been working hard all year to spread the culture of soba in Los Angeles. 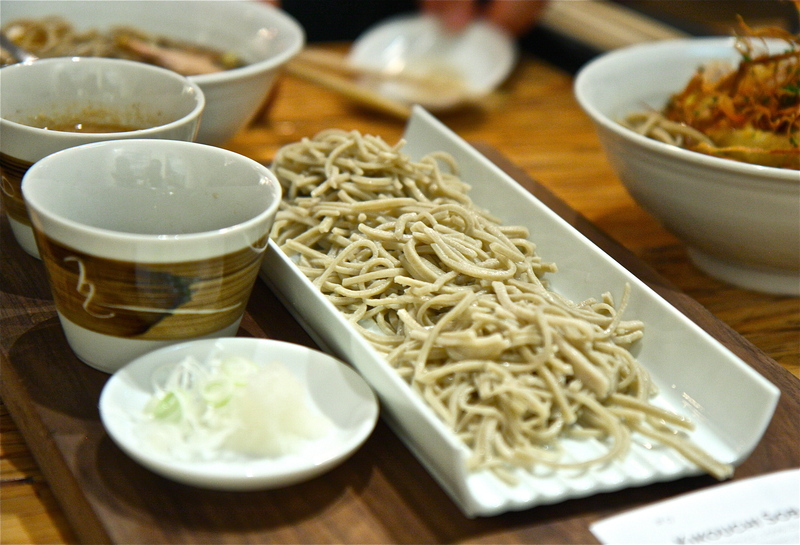 Many trips to Japan, many suitcases of freshly milled Japanese buckwheat flour, many soba classes in Sonoko’s house and many long hours of preparation for their pop-up soba event at the Breadbar, all in the name of wanting Angelenos to understand the culture of Japanese soba. Soba is Japan’s soul food, full of tradition and sacred history. Thanks to these dedicated soba artisans, I was able to have a taste of home and a moment of peace as I dipped these delicate buckwheat noodles into their homemade bonito broth and happily slurped away. 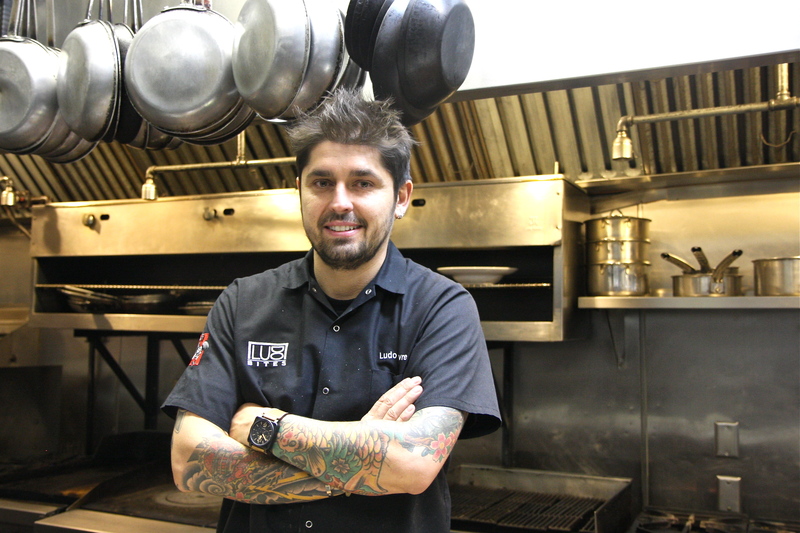 Chef Ludo needs no introduction- he took command of the Los Angeles culinary scene with his sensational and popular pop-up events, LudoBites 4.0, 5.0 and 6.0 in 2010. 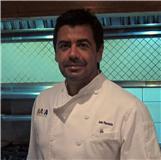 Every dish was whimsical, colorful, flavorful and creative, delighting diners with his ever changing menu ideas. 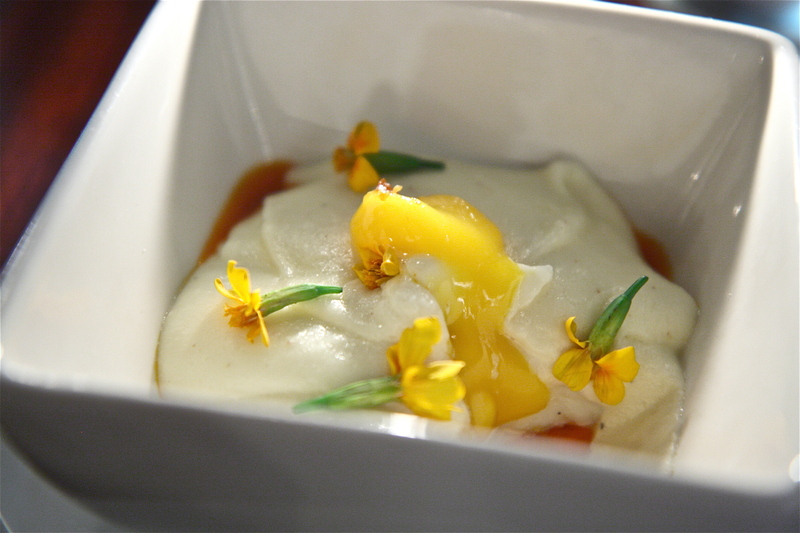 There were many favorites, but the stand-out dish for me was the silky potato mousseline over a perfectly poached egg, bursting with warm yellow yolk that melted right into the fatty chorizo crumble. Every bite made me want more and more. I wanted to share this wonderful dish with my friends, but I also didn’t want to share this wonderful dish with my friends. What was I to do? Order another round, of course, which I did at every visit to LudoBites 5.0, my favorite of the 3 this year. Ludo’s talent and success got much deserved praise from critics on both coasts, but there were always people who wanted to criticize, scrutinize, dissect and rip him apart. People love to hate this handsome charismatic chef, but what they don’t know is that behind each artistic and poetic dish was a lot of blood, sweat and tears- literally. Despite a debilitating medical condition that would normally deem a person completely disabled and incapable of working, Ludo fought hard through each day of LudoBites to cook for his dedicated fans. He gritted his teeth to endure relentless pain and gave his best smile for at least 20 photos a night, but I could see the pain in his eyes. Dedication and hard work never meant more to me than at LudoBites this year, and for that, hats off to this amazing chef. Mo-Chica and its star chef Ricardo Zarate are now on Los Angeles’ Best of list, and in the next few months we will be seeing the opening of Mo-Chica’s new downtown location and Zarate’s new anticuchos restaurant Picca, but he almost never made it this far. In the first year of business, Mo-Chica nearly went under. People didn’t think to try this new restaurant that was serving lamb shanks and arroz con pollo for close to $10 a plate, when adjacent taco stands in the Mercado la Paloma food court were offering $3 plates. 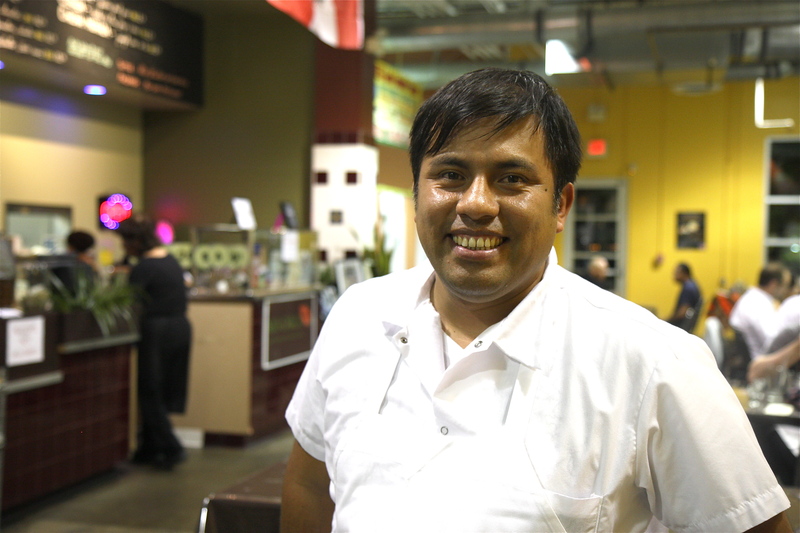 Zarate had a vision, and he didn’t want to compromise on quality or preparation. He knew that some day, people would understand his food and how good it was. Almost a year went by, and he was paying out of his own pocket to sustain the business. Finally, food critics caught wind of this amazing Peruvian chef, and just like that, the news spread like wild fire and Zarate was well on his way to recognition. His food is fantastic, each bursting with vibrant flavors, with a delicate sensitivity that reflects his training in Japanese cuisine. The regular menu is solid, but every last Thursday of the month he offers a 6 course tasting menu for $30, possibly the best deal in the country. I have had grilled octopus with cilantro pesto on a bed of aji mashed potato, mackerel tempura on seabass ceviche, and braised short ribs to satisfy even the most stern critic, all memorable and stellar. 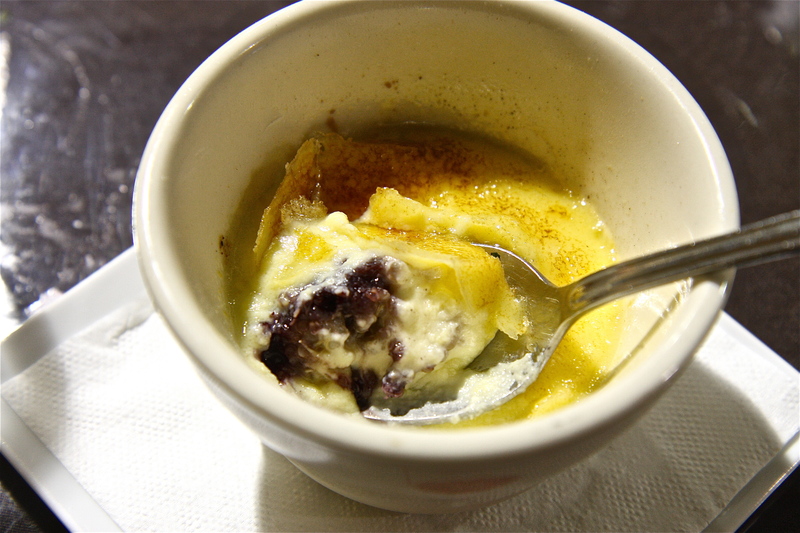 However, it was a quinoa and purple corn crème brûlée on one such tasting dinner that made me gasp with delight. Not too sweet, perfectly creamy, with a beautiful deep purple hue, and most of all a surprisingly delicious way to enjoy quinoa. ‘I was supposed to use kiwicha, but I didn’t have any, so I substituted quinoa at the last minute. I hope it’s still good?’, the ever so humble, honest and kind chef told me. Even such accidents, under Zarate’s spell, become a delicious miracle. 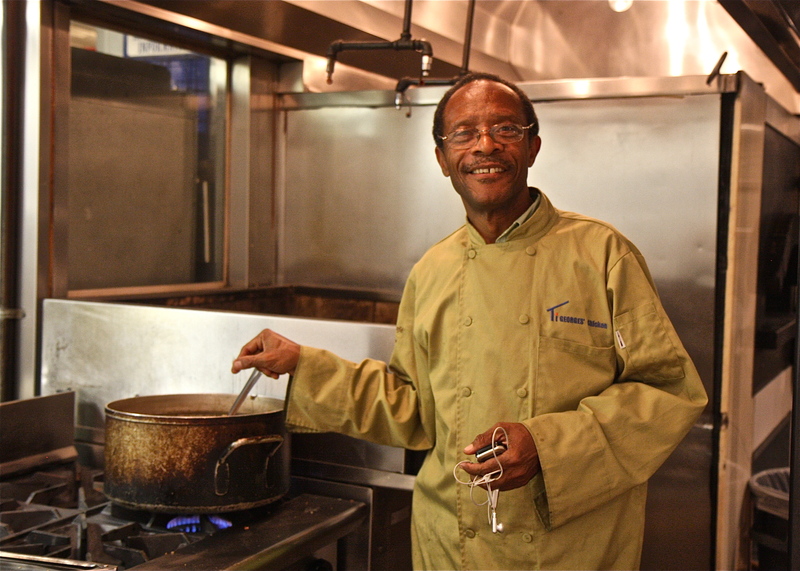 In the wake of the devastating earthquake that shook Haiti in January, no dish tasted more soulful than the goat meat fricassee that Haitian chef Georges LaGuerre, affectionately known as TiGeorges, cooked for his Test Kitchen dinner. TiGeorges himself lost his restaurant to a fire while working hard to raise earthquake relief funds, and this Test Kitchen dinner was the first time that he was able to cook for Angelenos again. Goat meat was baked with key lime, boiled in vinegar, then grilled over a fire and served with a sauce of key lime juice, olive oil and habanero chiles. The long process of cooking the meat resulted in an incredibly tender juicy plate of meat that fell effortlessly off the bones. Haiti is a beautiful country that has endured years of foreign occupation, slavery, poverty, corruption and now one of the worst natural disasters that the modern world has ever encountered. This cabrit dish represented Haitian pride, strength and soul, just like its talented chef TiGeorges. Michelin starred and Iron Chef conquering female chef Dominique Crenn, who is opening her own restaurant Atelier Crenn in San Francisco next month, graced us with her presence and her sensational talent at the Test Kitchen in Los Angeles for one special evening this month. After having eaten at more than 12 Test Kitchen dinners this year, I can honestly say that her dinner was the single most impressive and delicious dinner of them all, displaying graceful beauty and culinary elegance. As a speaker at the TEDx Bay Area Women event earlier this month, she shared her vision of using food as a medium for honoring nature as our ultimate nurturer, and her pledge for caring for our food sources by ‘returning to the soul’. Indeed, every dish at her 5 course Test Kitchen dinner was a poetic tribute to mother earth and her plentiful bounties that sustain our lives, and was worthy of taking the top 5 places for my best 12 dishes of the year, but one stood out above the rest. 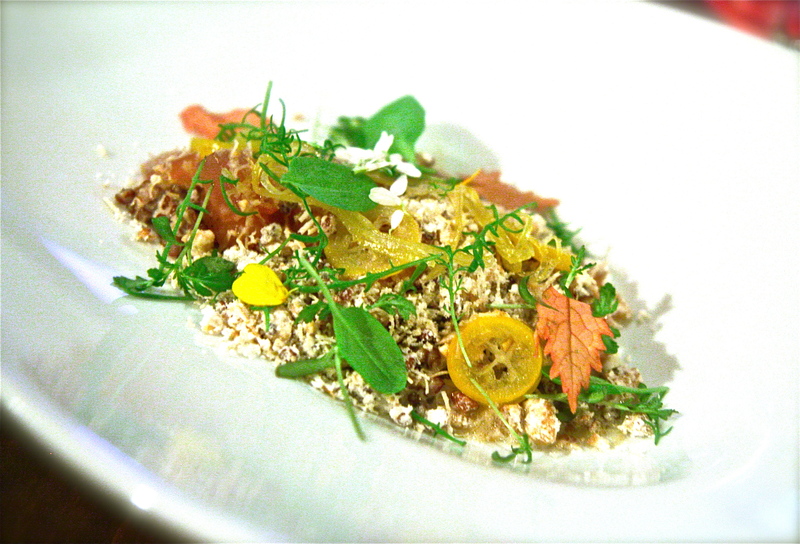 The winter grain porridge, a new type of dessert, that evoked a garden on a sloping hillside with its soft bed of red Peruvian quinoa cooked in chamomile tea, poached quince braised with Tahitian vanilla, hazelnut milk, nougatine, and micro chamomile and hibiscus flowers that sprouted from the soft earth, strewn between orange and green leaves that all together illustrated a portrait of nature. The textures were soft, light, chewy and crunchy, and I felt like I was digging my spoon right into the earth. It made me feel happy to be alive. Stepping through the entrance of Urasawa for the second time, I found myself breathing a sigh of relief, for I knew that I could just relax, sit back and get the best food and the most stellar service of my life. Beer poured in a ceramic beer mug was at the perfect temperature, the cypress countertop sanded down every day with 3 types of sandpaper was soft and supple, and when I took my camera out of my bag, Chef Hiro summoned his server to lay a white cloth napkin on the counter upon which to place my camera. It was like being back home in Japan, where attention to detail and meticulous service was the standard. 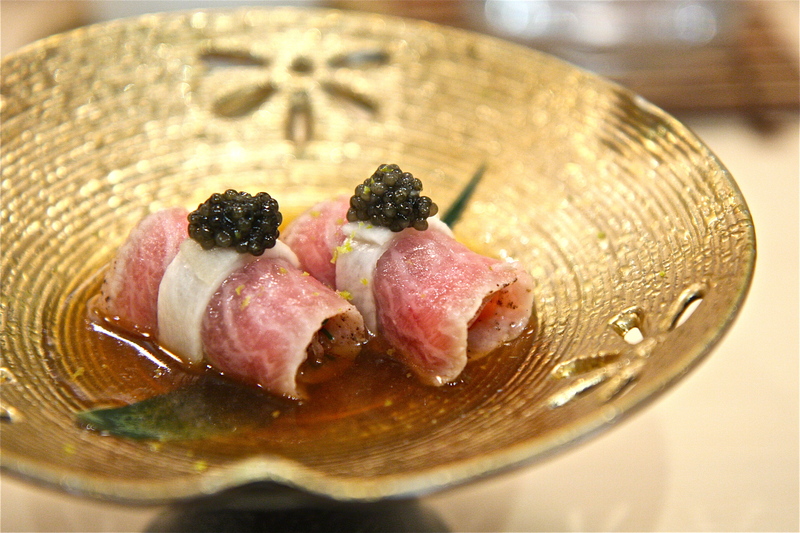 Here, in this Beverly Hills haven, I had many amazing dishes, one of which was a seared toro wrapped around monkfish liver and myoga ginger, neatly tied in the center with a strip of Kyoto turnip and topped with a heap of caviar. Little yellow flecks of yuzu rind added a refreshing aroma to the ponzu sauce, all perfectly presented on a golden ceramic pedestal. 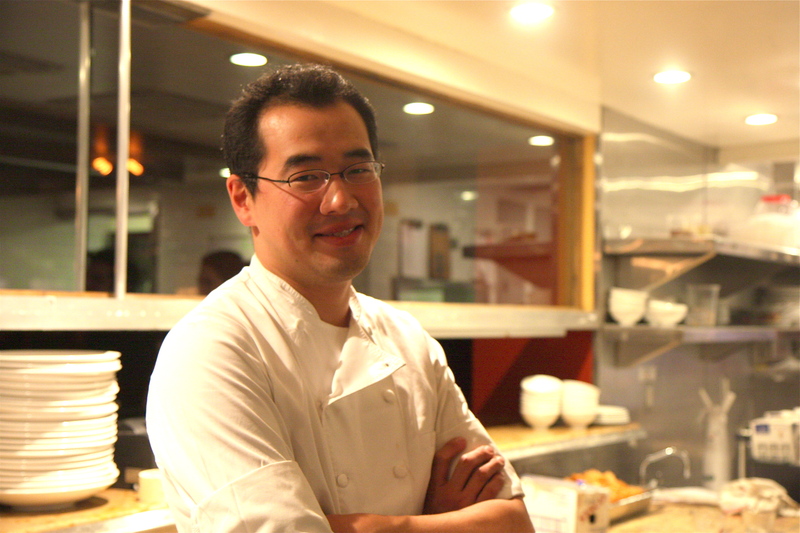 Chef Hiro is a true professional who exemplifies the Japanese culture of precision and obsession. What people don’t know is that despite Urasawa’s reputation, Chef Hiro doesn’t make much money from his business. 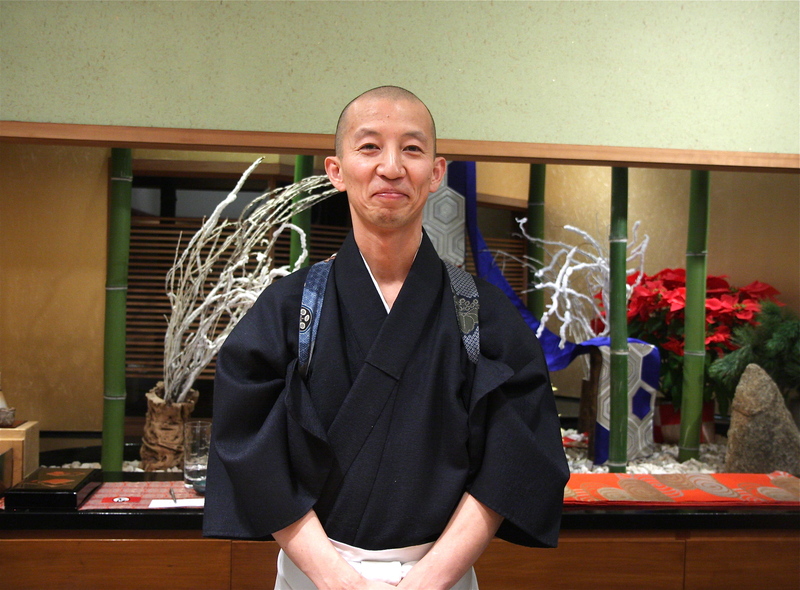 He pays an enormous amount of rent, to honor the same space that his teacher, Chef Masayoshi Takayama of Masa, has given him, and he spends most of his money in preparing the best quality ingredients for his meals. He lives in a rental apartment in downtown LA, and doesn’t even own a computer. Oblivious to the fact that Urasawa has been on numerous blogs, he thought about it for a second, and then asked, ‘so…these blogs…it’s like, free advertising?’ Indeed, Chef Hiro, indeed. Thank you to all of these wonderful chefs for making 2010 a special year for me, and bringing beauty and meaning to my life. 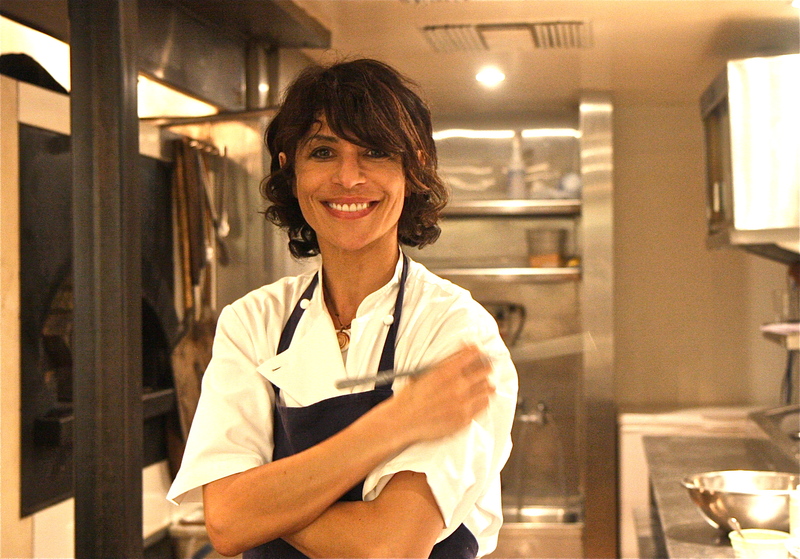 Their dedication and hard work to their craft is admirable, and is reflected in their food. May 2011 be an equally delicious year for all!